Is it spring yet? We've been having some really great days and some days that keep us inside. The kids definitely prefer to be outside playing on the playhouse or riding bikes on the driveway. 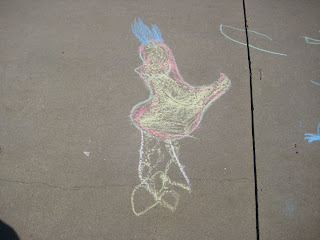 Another favorite is drawing with sidewalk chalk. And going for walks around our lake is a special treat they really enjoy. This is a Meadowe original. She called it "smiling chicken." Finn has been promoted to a big boy bed! It was quite a surprise for even me, because as it turned out I got a new bed too! So Finn inherited our old bed and the crib was dismantled and stored. It was for the best because he was climbing over the rail, and was quite efficient at it. He would raise himself up on his arms high enough to swing a leg over, then the other leg would follow, and he would silently slide down til his feet softly lit on the floor. Here, Meadowe was excited for Finn to have a new bed and she wanted to help him celebrate by having a sleepover in Finn's room. Finn is my sous chef! I can't even hardly get started on a meal and he's pushing a dining chair over to the stove to see what I'm doing and to help in his little way. 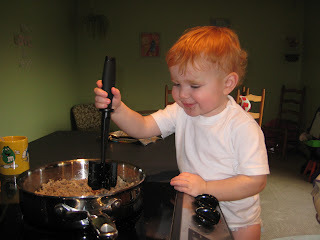 He loved helping me crumble the hamburger with one of my all-time favorite tools, many of you know it as a Mix 'n Chop. "How much water can one lake hold?" seems to be the question on everyone's mind. 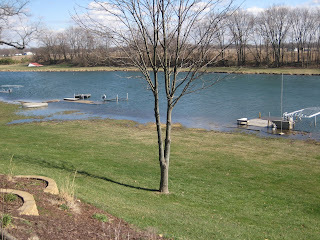 The lake is over-full at this point, much like it was last year. Yards are flooded, piers are under water, and even one of our pier sections has floated away to the other end of the lake. Reading is fun! And for once we like being right beside each other. This really is a rare moment in this house. 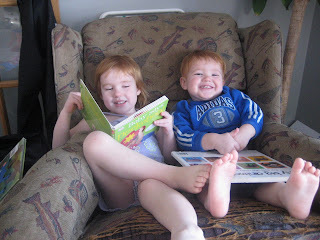 Not the reading part, but the fact that they can sit in the same chair and not fight about it. We've been visiting the library for story time and listen to great stories, make a craft, and have a snack. Meadowe even has her own library card now. She is so proud! Next week at the library there'll be a tea party. "Daaaahhhhh!" says Finn. As in, "ta-da! I dressed myself! Aren't you proud of me?" All of a sudden, Finn is proficient in getting dressed. 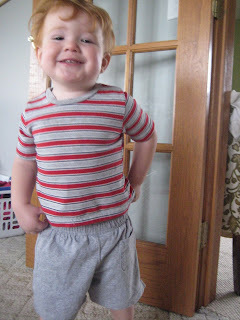 He picked out this outfit, put it on, and ran right out to the living room to show me. Nevermind that the shorts are on backward. They're ON and over the back of his diaper, and that's an accomplishment. Recently Meadowe was bored one afternoon and a pair of scissors found their way into her hands. I came into view of her and she was holding clumps of her hair in her hands. 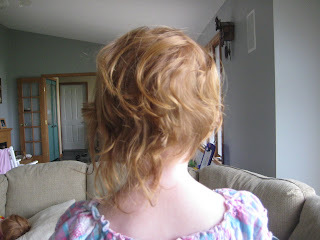 I looked at her and she had chopped away hair on the right side of her head! I couldn't decide whether to laugh or to cry out of sentimentality. 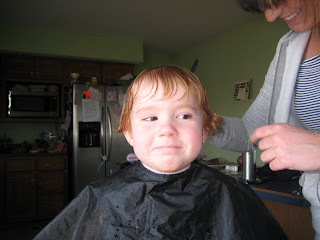 I commandeered the scissors, and racked my brain on what to do. I knew I couldn't salvage it. I eventually called the neighbor who is a hair stylist. 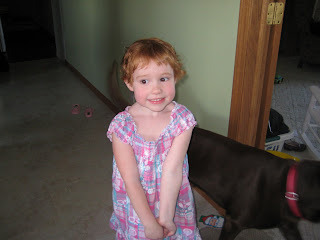 She came over and created a cute pixie cut from a near-disaster. Finn is making many new discoveries, especially with language. He is using 2 word phrases on a regular basis. He loves to try new words and his little toddler voice is one of the most precious sounds I've ever heard. 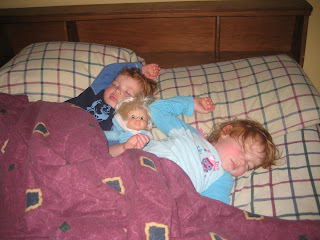 After the cousins leave in the afternoons, Meadowe & Finn camp out on the couch watching children's programming. Finn often falls asleep and this one particular day, I caught him dreaming. It must have been good because he smiled a lot! 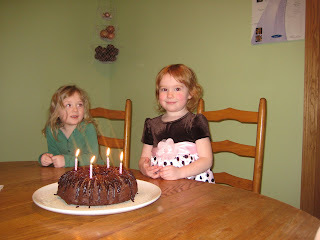 For at least a week, all we heard about in our house was Meadowe's birthday party coming up, how old she is going to be, and what we were going to have and do at the party. Meadowe made up her mind pretty early that she wanted a "pi-ata," translation: pinata, for her party. So Ora said, "sure, and we'll have fajitas, too." And going along with that I decided on an appropriate dessert. We had Everything! Chips & salsa, a make-your-own-fajita buffet with all the toppings, and Mexican Chocolate Cake. We even had the "pi-ata." Meadowe was all decked out in her beautiful dress and couldn't wait to hit the pinata. The house was full with family and friends and a festive mood was in the air. The food was amazing, beef and chicken marinating in a homemade fajita sauce for about 20 hours, and cinnamon-y chocolate cake drizzled with chocolate sauce. 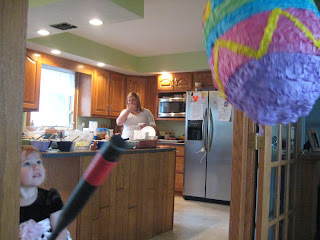 Meadowe wanted first dibs at the pinata, so she gave it as good a whack as she could. Not surpising to any adults, it didn't bust open with that first hit. Meadowe thought it would and was quite disappointed that it didn't. 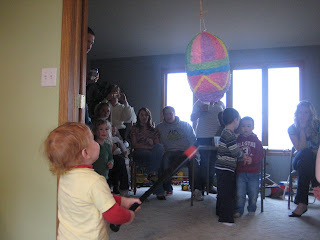 All the other kids had a turn, or 2 or 3, at the pinata. Finn couldn't wait to get in on the pinata action. After some strong blasts, the pinata finally broke and candy rained down for all the kids. 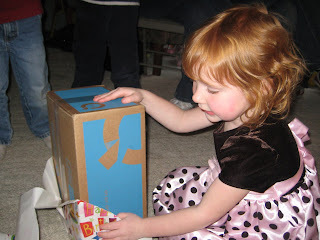 Meadowe opened her presents, and we send a grateful thank you to all gift-givers. It seemed everyone had a great time, enjoyed the food, had some laughs over the pinata, and loved spending time with family and friends. And those are the best memories. 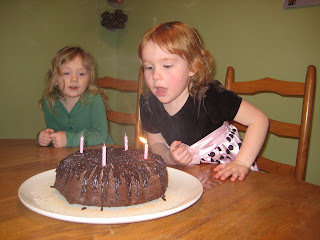 The kids have their birthdays very close together so it's easy to get caught up in all the birthday excitement! Finn is now a big 2-year-old and Meadowe is 4 years old today!!!!!! 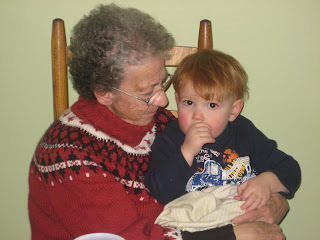 Great-Grandma Gates gets some cuddle time with Finn before the festivities begin. 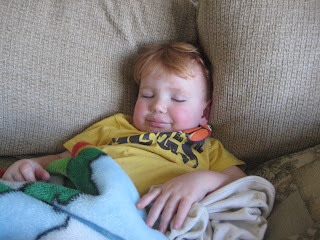 Finn has the standard "dee" (favorite blankie) and the thumb in his mouth. He doesn't go anywhere or do anything without them! 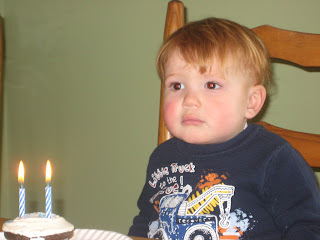 Finn's not so sure about the requisite singing of "Happy Birthday." He was quite wary of everyone watching him. 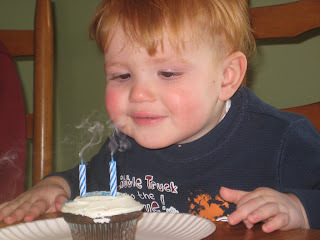 But that soon ended when he realized he was going to get to blow out the candles. He's had practice: he likes to blow Meadowe's hair around and watch it fly! MMmmm!!! 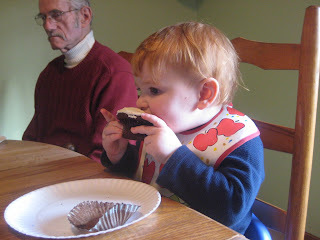 That's a great cupcake! So, Meadowe thought she would be the best big sister in the world and she "wrapped" one of her toys, the big yellow rubber ducky, in "wrapping paper," aka her favorite 'dee,' and gave it to Finn for his birthday. 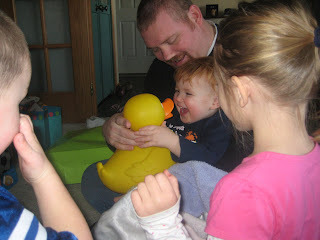 Well, he got the biggest kick out of unwrapping that rubber ducky and you can see how elated he is. 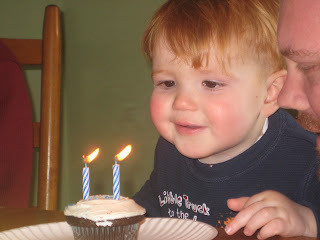 More birthday pictures to come . . .